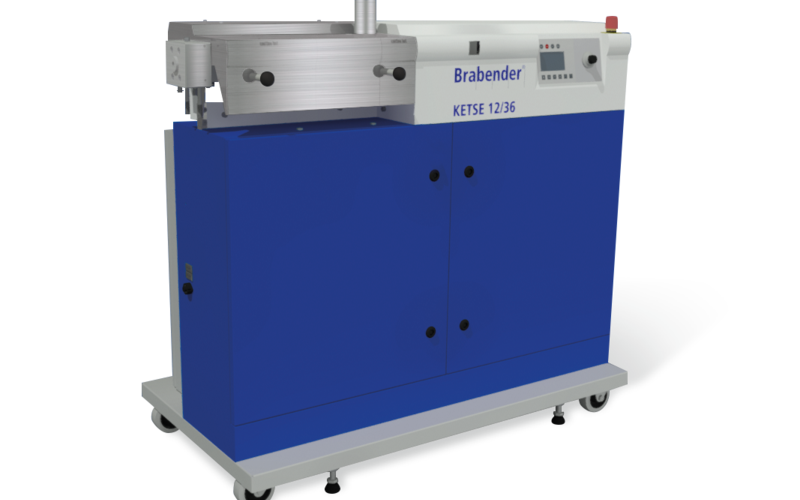 With the new mini-compounder KETSE 12/36 Brabender offers a twin screw extruder in miniature scale which is applicable in the plastics industry as well as profitable for the pharmaceutical industry for development of pharmaceutical products. The scale-down of the machine combined with the comprehensive adaptability to almost each processing task and the easy handling of the system constitute the distinction of the mini-compounder as an excellent laboratory instrument. The processing unit of the mini-compounder consists of a horizontally divided barrel with a length of 36 D which can be tilted open and allows visual assessment of the processing steps. Thus comfortable removal and quick cleaning of the barrel is allowed. In addition to the main metering, metering or venting ports at a barrel length of 6 D, 12 D and 26 D are available. Necessary side feeders can be installed at a processing length of 14 D.
The scale-down of the machine in combination with the comprehensive adaptability to almost each processing task and the easy handling of the system, explain the distinction of the Mini-Compounder KETSE 12/36 D as an excellent laboratory apparatus. The modular screw conception offers all individual processing possibilities. Even minimum samples asit is especially required in the pharmaceutical industry can be processed with the Mini-Compounder KETSE 12/36 D.
The Mini-Compounder KETSE 12/36 D has an integrated drive with a power of 3.8 kW and reaches speeds up to max. 600 U/min. The clam shell barrel is divided horizontally, can be tilted open, and allows visual assessment of individual processing steps. Furthermore, a comfortable mounting of the screws and a quick cleaning of the barrels are possible. In addition to the main metering, metering or venting ports at a barrel length of 4,5 D (for liquids only), 10 D and 27 D are available. Side feeding can be installed at 12 D length. The Mini-Compounder KETSE 12/36 D is supported by CAN open bus technology. Recording and evaluation of measuring data as well as control of the entire machine system are done with easy-to-handle software under Windows®. Of course, the necessary additional equipment like measuring and control units or metering systems (gravimetric, volumetric, liquid) as well as down-stream equipment is available, too, allowing for modular setup of complete extrusion lines.